ROCHESTER, NY – Sporting a much fatter and whiter look, Tiger Woods finally broke his major victory drought, which extended all the way back to the 2008 U.S. Open, with his win today at the PGA Championship. 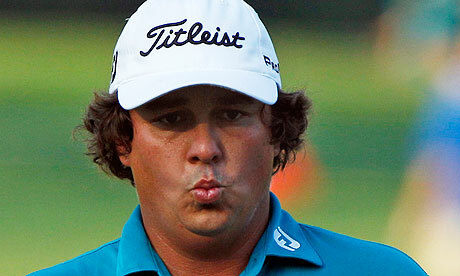 A chubbier and much more docile Tiger blasted a round of 63 on Friday, a PGA record, thrusting him into the lead. From there, the rotund, emotionless Mr. Woods was able to maintain his spot on the leaderboard and ultimately win over runner-up Jim Furyk. All weekend, Tiger resembled his former, pre-scandal self, at least in performance—in physical appearance, the 2013 Tiger looked nothing like the Tiger of 2008. “After the scandal, I just wanted to start anew,” said the 15-time major champion. “So I completely stopped working out and caring about what I ate. And my therapist has been helping me keep all my emotions bottled up inside. And I quit being black.” According to many sports analysts, the new, portly Tiger Woods has a bright future ahead of him, and some say he can make a flabby run at Jack Nicklaus’ record 18 championships. In the most surprising news, Elin Nordegren remarried the tubby Woods, changed her hair color, and now goes by the name of Amanda Dufner.